Our schematic is fairly simple, we will have one pin (GPIO #13) monitor the door sensor. We can put the ESP8266 in low power mode and then 'wake up' every few seconds. This is way better for battery life than just keep the ESP8266 awake forever. To do that, tie pin GPIO #16 to the RST pin, that way the auto-wakeup will work. Note that even with low-power sleeping, this setup draws about 20mA on average! Before you even upload code to the arduino, you'll need to get your IO account going - that way you can properly test your code and connection! The first thing you will need to do is to login to your Adafruit IO account and get your Adafruit IO Key if you haven't already. Click the AIO KEY button on the right hand side of the window, to access your key. You will now need to create feeds called "door" and "battery". If you need help getting started with creating feeds on Adafruit IO, check out the Adafruit IO Feed Basics guide. Now you can start pushing data into the feeds, by wiring up and uploading the sketch to your Arduino! You will need the Adafruit IO Arduino library installed to compile the example sketch. The easiest way to install the library is by using the Arduino IDE v.1.6.4+ Library Manager, and searching for Adafruit IO Arduino. You will also need to have the ESP8266 Arduino board package installed. For more info about installing the ESP8266 package, visit the HUZZAH ESP8266 setup guide. Ensure the board package used for the HUZZAH ESP8266 is >= version 2.4.0, older versions have an issue with waking from DeepSleep. Use the package index URL above to get the latest version of the ESP8266 package. You must have your Adafruit IO account set up first before you try to connect! The Arduino sketch for this project is fairly straight forward. We'll be using the IFTT Door Detector sketch for this guide. Make sure to download both the sketch (IFTTT_Door_Detector.ino) and the configuration file (config.h). To configure your ESP8266 with your Adafruit IO account, you will need to set up your IO_USERNAME and IO_KEY in the config.h tab. To find your IO_Key, navigate to your profile, click View AIO Key, and copy the ACTIVE KEY field to your clipboard (ctrl+c or command+c). In config.h, replace the IO_KEY with the IO Key copied to your clipboard. By default, the sketch sends the battery level to Adafruit IO once every 5 minutes, and checks the state of the door once every 3 seconds. You can modify these intervals by changing the BATTERY_INTERVAL and SLEEP_LENGTH constants. Setting these constants to lower intervals will result in reduced battery life. The bulk of the work for this example happens in the setup() function. The sketch restarts into setup() after it wakes from sleep, so the main loop() never runs. // so we use eeprom to track the count between resets. // so we should send a value to Adafruit IO. // we are done here. go back to sleep. 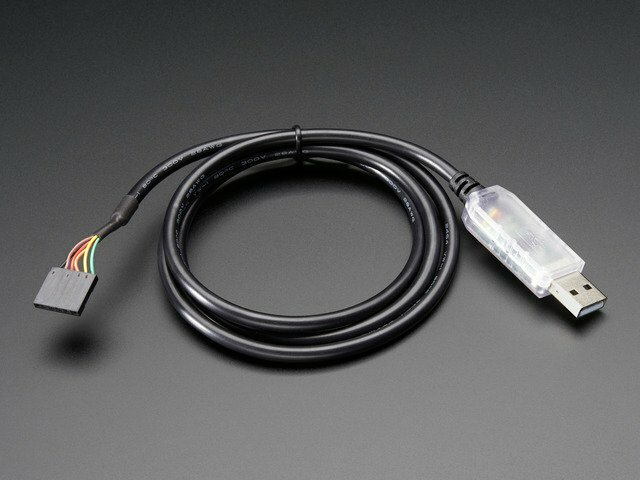 The code that connects and sends the state of the door to Adafruit IO can be found within the door_open() function. The HUZZAH 8266's battery level is sent the Adafruit IO battery feed once every five minutes. If you want to increase or decrease this interval, you can edit the BATTERY_INTERVAL constant. Be warned, though, decreasing the number will decrease your HUZZAH's battery life. // read the battery level from the ESP8266 analog in pin. // analog read level is 10 bit 0-1023 (0V-1V). 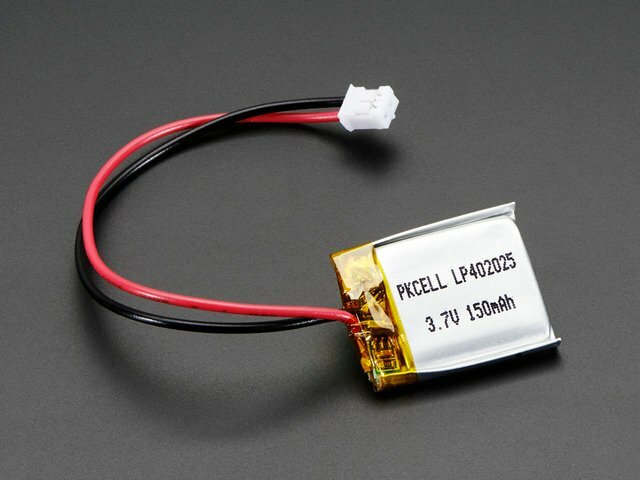 // lipo value of 4.2V and drops it to 0.758V max. // and the max analog read value should be 774 (4.2V). 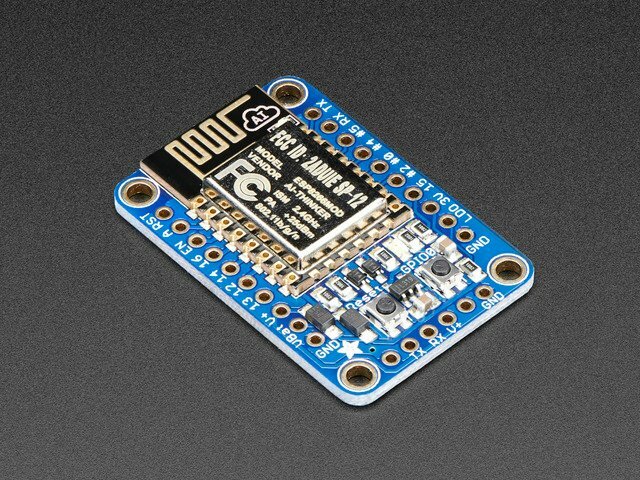 OK now that you have everything wired up, and your Adafruit IO account set up, upload the above sketch to your HUZZAH ESP8266 board via the FTDI cable or another serial connection. What you're seeing is the HUZZAH reading the sensor (Door closed and Door is open!) and then going to sleep (the zzz text indicates its about to go into sleep mode. When the ESP8266 goes to sleep, it resets the board, and so the weird text after the 'zzz' is the reset debug string. Its normal but some terminal programs print it out a little differently. Log into your Adafruit IO account and look at the door feed to see the messages as they are logged! After the board is active for five minutes, you'll also see the board measure the battery voltage and upload that to the separate battery feed. This guide was first published on Oct 19, 2015. It was last updated on Oct 19, 2015.